To update to this version, simply run tdm_update.exe in your darkmod folder. The Dark Mod 2.06 now released! 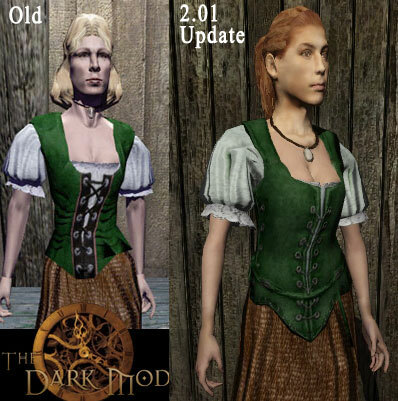 After a lengthy public beta phase, we are proud to announce the release of The Dark Mod 2.06! The Dark Mod has undergone a lot of reorganization under the hood. A substantial amount of work was done to improve rendering performance and overall framework tech. Legacy OpenGL methods have been replaced with their equivalents in modern OpenGL. This is also the first TDM release to offer a native 64-bit build. Better Visuals: Duzenko and Stgatilov have implemented a Soft Shadows option that finally removes the sharp edges of TDM shadows. This has a huge impact on the visuals of TDM missions. This option is currently labelled “Experimental” in the menu as we have had reports of issues on certain hardware. See here if you are experiencing flickering or other problems. Better Sound: EFX audio now allows users without Creative hardware to enable EAX in the menu—a feature that processes reverb data and changes sounds based on the surrounding environment. Currently, only a few maps, like Volta 2: Cauldron of the Gods, by Kingsal, are set up to use EAX effects, but since all users can now benefit from it, mappers are encouraged to use this feature going forward. Interested mappers should see here. Better Menus: The TDM menus have also been given a visual update, boosting the resolution and adjusting the graphics for widescreen monitors. Durandall has added scrollbar functionality to the mission menus, and Obsttorte has implemented a new menu option that allows users to customize the size and opacity of HUD elements, complete with a visual preview. New Assets: A new set of Springheel’s architectural modules is included in this release–a set of 50 models for creating church interiors. A number of new models have been added to other sets. Also included is a huge number of new prefabs, allowing mappers to quickly and easily create detailed map sections, as demonstrated in Springheel’s Speedbuild series. Better Mission Intros: This is the first TDM release to offer video codec support other than ROQ. TDM 2.06 allows for FFMPEG video support, which means that mappers will now have an easier time adding video briefings to their missions. Better Gameplay: An error that kept food from restoring health has been fixed, and all food will now restore a certain amount of health when eaten. Guards can now sleep and wake up while seated. Better Performance: Finally, experimental multi-core support is included for the first time, via patches from Cabalistic’s VR branch. While this can cause performance enhancements, it is currently in “Experimental” form as some users may experience random crashes with this option enabled. Uncapped FPS is also now an option for users after this update. To update, simply run the tdm_update.exe file in your darkmod folder. Please be aware that old saved games will not be compatible with 2.06, so finish any missions you might be in the middle of first! Announcing the new The Dark Mod 2.03 update! 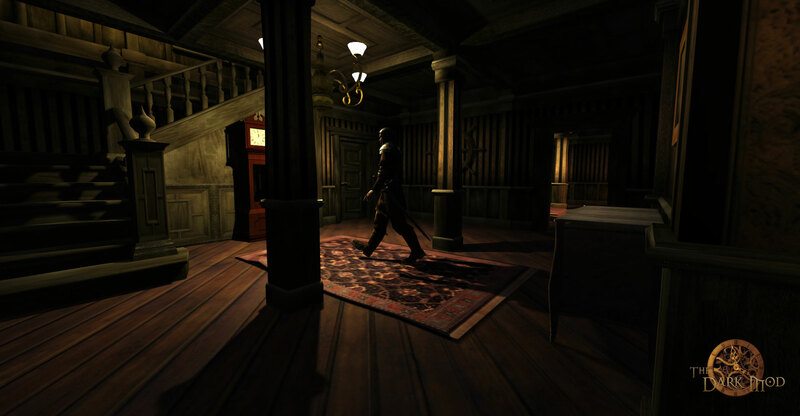 The team at Broken Glass Studios is very pleased to announce the latest update to TDM! The update to 2.03 adds nearly nine months of new assets, features, and bugfixes . Some changes will be noticeable right away, while others will take a while to appear in new maps. To apply the update, simply run the tdm_update.exe file in your darkmod folder. (Note that saved games from earlier versions will not be compatible with 2.03, so finish any missions you are playing first). Some of the improvements are listed below. To see the full changelog, go here. AI changes: AI have a few new animations, including a new pickpocket reaction. Many AI, including the citywatch and builder models, should look more detailed, as most AI are now using LOD (Level of Detail) stages, allowing greater detail up close and less detail (and less of a performance hit) when further away. In terms of behaviour, AI will now coordinate their searches more intelligently when in groups, sending some AI to guard doors and choke-points rather than stepping all over each other. AI will now react when getting hit by an opening door. An issue that allowed AI to see behind them if their head was turned a certain way has been fixed. Graphics: Particle effects have been greatly improved, so that they no longer create hard lines when intersecting geometry. Water no longer distorts things that are in front of it, and the skybox will no longer flash grey when the player is mantling. The spyglass will now appear round regardless of the screen dimensions used. A number of entities are now using LOD (Level of Detail) stages. You may wish to adjust this option in the Graphics Menu if you see noticeable ‘popping’ of models. Assets: More than a hundred new high-quality textures and models have been added to the game, and should start appearing in new maps. 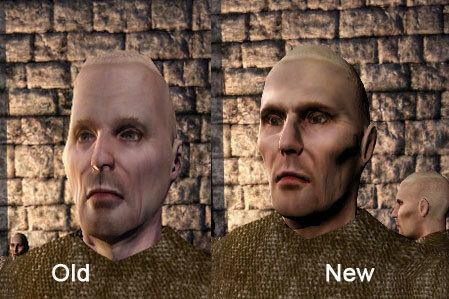 A number of existing models have been improved by adding more polys and better textures. A new female townsfolk model and vocal set has also been added to the game and should start appearing in new maps soon. A video preview of some of the new features can be watched here. Overall, you should notice a distinct improvement to the graphics and AI behaviour in maps. And we have some exciting renderer developments in the pipeline, though that will have to wait for the next update. Hope you enjoy it! We’d love to hear feedback in our forums, or on our Facebook page. 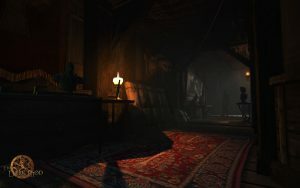 Requiem wins Thief Mod competition! Square Enix and Amazon.com have announced the results of the THIEF mod contest! In the first category, “Look, I Created a Mod”, the winner is our very own Gelo (Moonbo) Fleisher with his TDM Fan Mission “Requiem”. As for the second category, “If I Could Mod, I Would Create…”, the winning team is Joachim Eko Sjoberg and Kevin Stuart Elliott for “The Lighthouse”. We’re getting close to a development freeze for our next update, which will include some important bug-fixes and a lot of goodies. We discovered a bug that affected more than half of all missions that caused loud noises to drop off quickly, meaning AI weren’t hearing noise arrows or yells for help like they should. Grayman is also adding new behaviour for AI who have been pick-pocketed. Additional menu customizations are on the way, as well as a new AI character. There have been a load of new missions released lately–4 new ones in March alone! And at least two new missions, one by Springheel and one by Moonbo, author of the hit “Requiem”, are due to be released soon. Good times for The Dark Mod! A small update, TDM 2.01 fixes several issues surrounding combat and makes some graphical improvements to character models. Some technical fixes have also been added: Taaaki has fixed the issue with TDM failing to reload missions if your folder was not named “darkmod”, and grayman has solved some save/reload crashes. The player was taking double damage from weapons in 2.0; grayman has fixed that, and Springheel has made several other modifications to combat, including making it harder to avoid weapons by running backwards. The end result is that combat has been made slightly more forgiving at lower difficulty and harder at the higher difficulties. This update improves the appearance of several female character models, as Springheel has worked on improving the meshes, as well as adding a few new heads. Lastly, a physics bug that made the map “The Swing” unplayable, has now been fixed. To get the update, simply run your tdm_update.exe file. Bear in mind that saved games may no longer work after updating, so be sure to finish any missions you’re playing first. 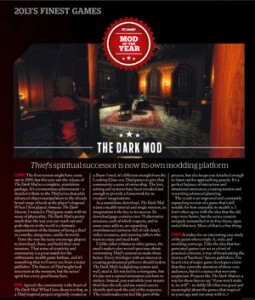 The Dark Mod is PC Gamer’s pick for 2013 Mod of the Year! In other news, we should have a new update out in a matter of weeks that addresses some combat issues and improves some female character models, among other things. Free, Standalone TDM 2.0 Now Available! We at Broken Glass Studios are happy to announce the release of TDM 2.0, a free, open-source, completely standalone stealth game!! Standalone: First and most importantly, The Dark Mod is now completely standalone, which means you no longer need to own Doom3 to play it! We have spent a tremendous amount of time and energy replacing all the sounds, textures, particle effects, and models that we had been using. Hopefully this will open up a whole new audience of people who didn’t want to have to purchase a different game in order to try The Dark Mod. AI Improvements: There have been lots of additions and fixes to AI behaviour; characters will now greet each other more regularly, and will properly call for help when they’re in trouble. Guards can now hear slightly better, and we have included a new AI Vision slider to the menu, so the player can adjust how sensitive they want AI vision to be. Characters react to bodies in more varied ways now. A bug that made AI very easy to kill has been fixed. Archers will draw melee weapons if the player gets too close. Guards will turn towards doors that open unexpectedly. There are new vocals for specific situations, like when guards are getting shot at and can’t see their opponent. Searching behaviour has been improved. Plenty of old bugs, like the one where AI would sometimes attack with an empty fist, have been fixed. New Gameplay: AI can now hear collapsing bodies, especially if the body is wearing plate mail and falls on a hard surface. No longer will a guard stand oblivious while his friend collapses to the ground two feet behind him. 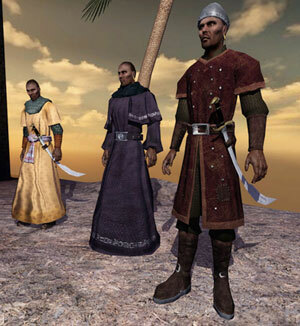 The player will have to give some thought to where they take down opponents if there are other guards in the area. Audio Improvements: In addition to replacing dozens of Doom3 sounds, two new vocal sets have been added to the game. Footstep sounds have been improved. 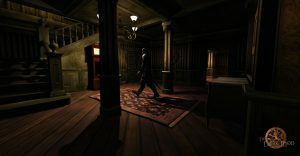 Big changes have been made to the sound propagation system that will allow mappers a lot more control over how players hear sound; for example, mappers can now make doors block different amounts of sound depending on their thickness, or can control how much sound passes through windows or small holes. 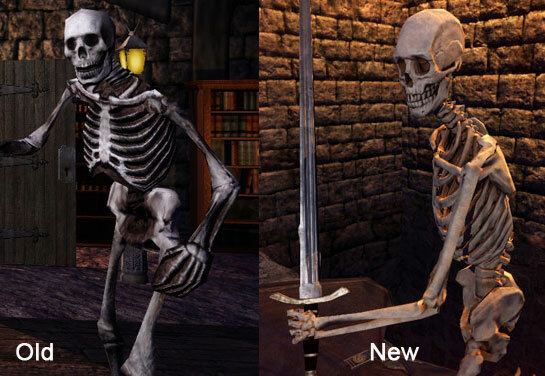 Graphical Improvements: You should notice a number of improvements to some character models, especially the skeleton, townsfolk, and beggar characters. Arrows will now leave blood-stains. There have been plenty of other bug-fixes, like removing the ability to hide in the shadow of an object you’re carrying (no more sneaking under a crate umbrella). See the full change-log here. Because of the removal and replacement of Doom3 assets, some missions that used them are no longer compatible with TDM 2.0. About two dozen missions have updated .pk4s to fix these issues. New players can ignore this, but if you’re playing missions that you downloaded before 2.0, you may have trouble trying to run them. Most are fine, but a few missions will just crash while loading, and others will load but will have odd visual problems. It is highly recommended that you delete all previously downloaded missions after updating to 2.0! Going standalone has been a mammoth undertaking. There were literally hundreds of assets that needed to be replaced, and around seventy maps that had to be checked to see whether any of those replacements broke anything. We’ve been testing for months, but it’s almost certain that we missed something, somewhere. If you see a black texture, a model buried in the floor, or something else unusual in a map, please let us know. If it was caused by 2.0 changes, we’ll make sure we fix it in the next update. To download TDM 2.0 for the first time, please follow the download instructions on the website here. Not sure what TDM is? Watch an introductory video here.